Already a hotbed of commerce and innovation, Kendall Square is on the verge of another torrid building boom that will fill in many of the gaping spaces in the former industrial area. Now Cambridge officials want to make sure there is still enough space left for relaxing and playing around. Rogers Street between Second and Third Streets, the Triangle parcel at Land Boulevard and First Street, Galileo Way between Broadway and Binney Street, and Point Park at Main Street and Broadway. A jury has winnowed the submissions to four finalists, who presented their proposals at public meetings in late March. Each teams of finalists received a $50,000 award, and the winning team, which will be chosen April 9, will receive an additional $50,000 award. 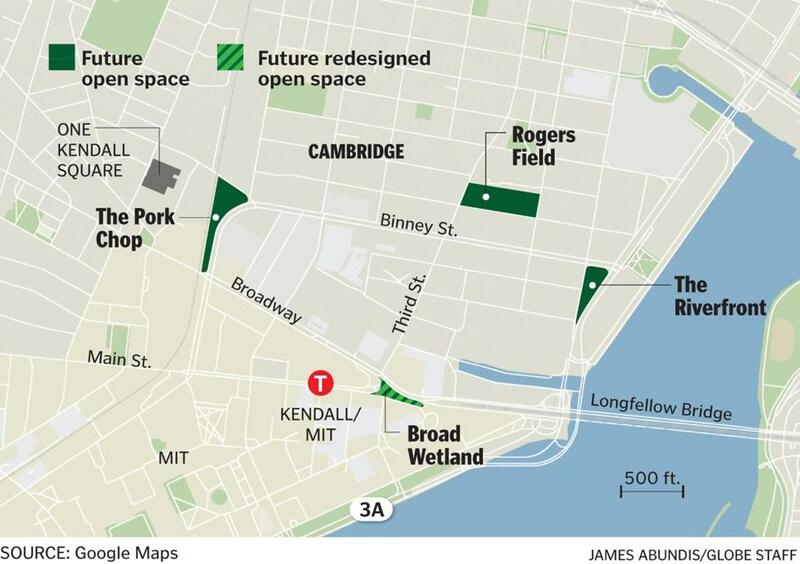 The winners will help Cambridge officials develop more complete proposals to redesign Kendall’s new open spaces. The nine-team members led by Richard Burck Associates Inc. took advantage of the water that courses along — and through — parts of Kendall (top). The Broad wetland would provide a habitat for small animals and help channel stormwater runoff. Team Burck also designed a series of parks and open spaces to break up large blocks of development and integrated them to improve circulation throughout the Kendall Square area. 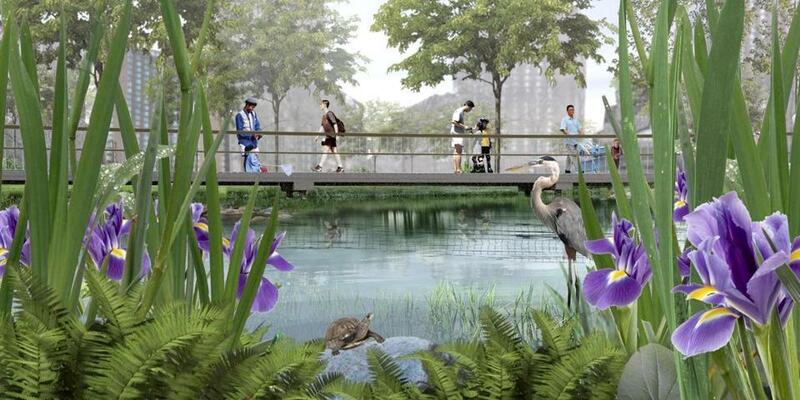 The 15-man Framework Cultural Placemaking team has planned four parks along the edges of Kendall Square and a network of connecting pedestrian pathways. One key area, the Riverfront , would include a swimming pier, boardwalk, and lawn for outdoor games. 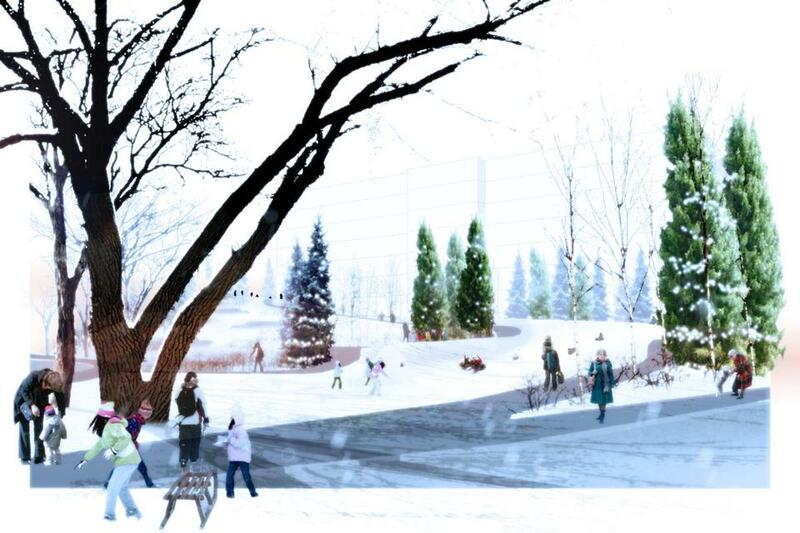 The MVVA team focused on outdoor play in designing a number of its outdoor spaces, including one parcel of land along Galileo Way, dubbed “Pork Chop” for its shape. It’s tabbed as a slightly wild open space that in winter could be used as a sledding hill and in summer would offer boulders, knolls, and thickets for youngsters to scramble among. 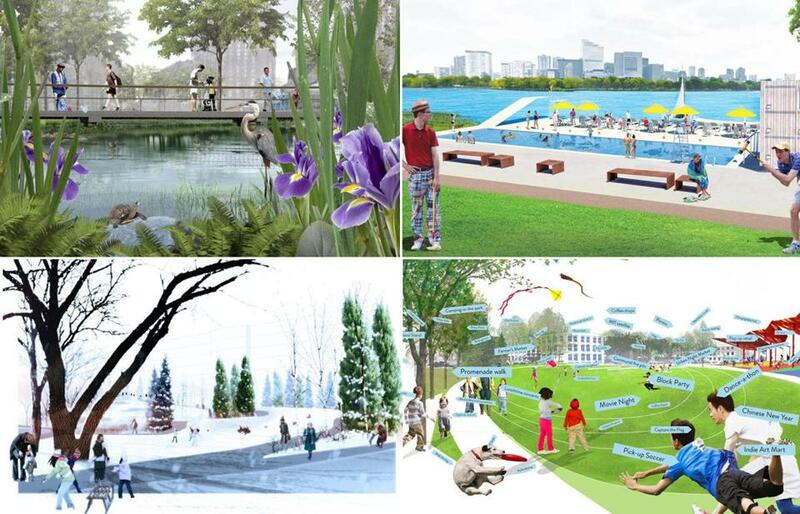 Other suggestions include a community garden, dog park, and concert amphitheater. The Sitelab team also had a sense of play built into its designs. 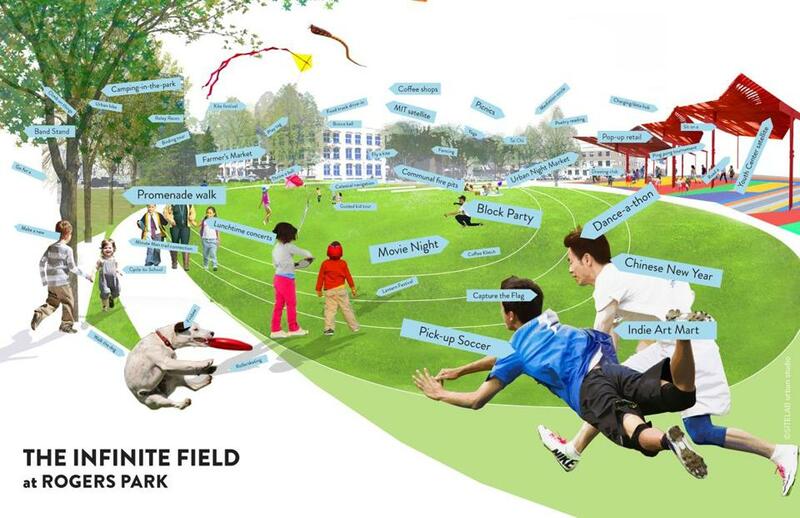 Seemingly riffing off the celebrated Infinite Corridor that runs through the nearby MIT campus, Sitelab proposed an Infinite Field at Rogers Park that could host pickup games, block parties, movie nights, and any number of additional activities that would bring together the Kendall community.